At least 28 people have been killed and 60 others wounded in the attack on Istanbul Ataturk Airport in Turkey, Istanbul Gov. Vasip Sahin told Turkey's state-run news agency TRT. It is unclear if the total includes the bombers. 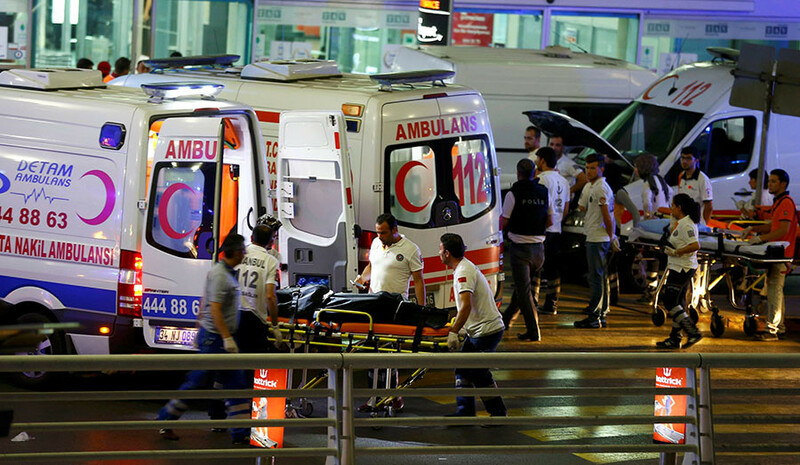 Another report, from semi-official news agency Anadolu, said six of the wounded are in critical condition. A total of 49 ambulances were sent to the site. Turkey's Justice Minister Bekir Bozdag earlier said at least 10 people were killed and 20 others injured. The suicide bombers were also killed. 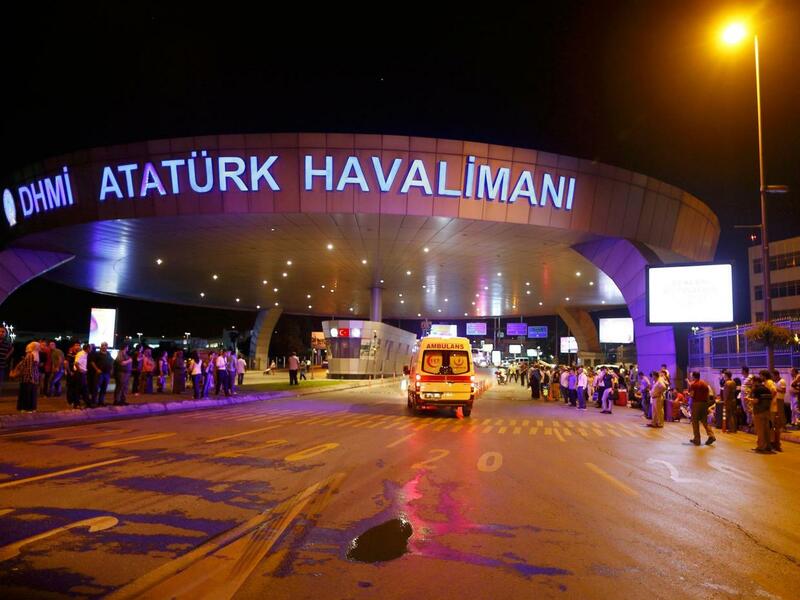 Bozdag said one attacker "first opened fire with a Kalashnikov then detonated himself" at the airport entrance. In total three bombs exploded, the governor told TRT. Videos posted on social media show travelers sitting on the airport floor. A man shouts, "Get down! Get down!" Someone cries as a gunshot rings out. Ataturk Airport is "one of the most secure airports in the world," CNN senior law enforcement analyst Tom Fuentes says. 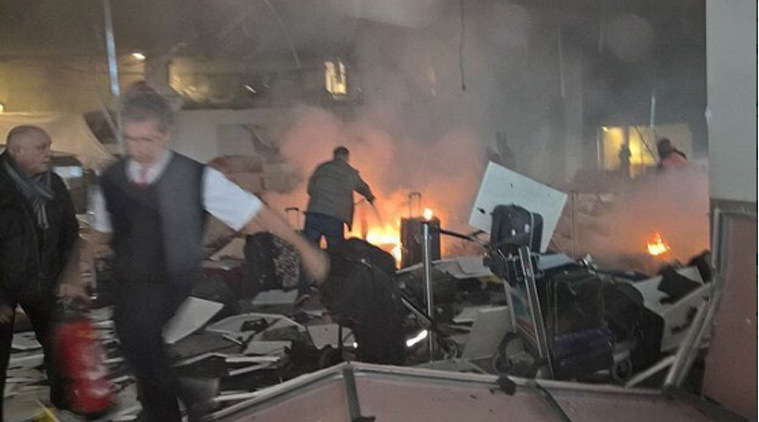 But the airport has been "very overwhelmed for several decades with terrorism from PKK." The U.S. embassy in Ankara, the Turkish capital, is sending consular officers to the airport to account for any potential U.S. victims. But there are no indications of any American casualties at this point, a senior State Department official told CNN's Elise Labott. 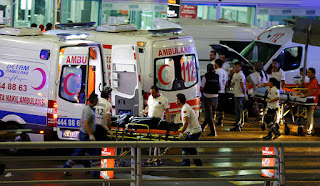 The attacks happened on a warm summer night at the airport, east of Istanbul, that is the 11th busiest in the world in terms of passenger traffic. CNN's Ali Veshi says it is a modern, sophisticated airport. "There are all of the major European and American boutiques there," said Velshi, who has traveled through Turkey many times. "... You see people of all shapes and colors, in all sorts of dress. If you want to target the cosmopolitan nature of Istanbul, this is possibly the most cosmopolitan, heavily populated part. You can target tourist areas, but this is the part where the world comes together." Two explosions and gunfire rocked Istanbul Ataturk Airport Tuesday, Turkey's semi-official news agency Anadolu reported.